The following essay appeared in Passages: Africa, the first issue of PEN America’s translation journal, Glossolalia. Glossolalia advocates for writers with limited access to the global reading community. By publishing works from lesser-translated languages, Glossolalia connects storytellers to audiences eager for a vivid, mind-expanding look at experiences unlike their own. “How to Eat a Forest: In Two Acts” was written by Billy Kahora, the co-editor of Passages: Africa. Almost everywhere, the redefinition of internal boundaries was carried out under cover of creating new administrative districts, provinces, and municipalities. These administrative divisions had both political and economic goals. Sometime in the late 1990s, a small number of individuals from the south of Narok District, Maasailand, holding title deeds, started making regular trips west and northwest into neighbouring Kalenjin land. The land brokers from Maasailand left their vast, cow-dung streaked and undisturbed plains and deep indigenous forests and travelled to the highly populated highlands of Bomet and beyond, as far as Nyamira District, Kisii. There they found large families, of three generations and even four, cramped onto as little as half an acre of land–working land that had been tilled season after season and was now choking. All that the land brokers had in common was that they were vigilantes of acreage and mpaka (border). The frontier in question was the southern part of the Mau Forest Complex, also known as Mau South (the Maasai call it the Maasai Mau, a name heavily disputed by the Ogiek, who claim to be indigenous forest dwellers occupying the forests that lie adjacent to Masaai plains). This frontier was a boon to those living in the once fertile, but now overpopulated, volcanic Kalenjin land and the Kisii highlands. The premise was simple and devastating: the crooked lawyers and surveyors arbitrarily changed the representation on a map to a magnification that stretched into the nearby Mau South Forest, a “neutral” and vast territory that was a natural space of forest that no one was protecting or looking after—or rather, had no private ownership of, the Mau South Forest protected by the Narok County council. Beyond the Narok border, the Mau Forest on Kalenjin land was protected by the government, as gazetted by the Kenyan parliament. There the forest remained sacrosanct and untouched. So lands that bordered the Mau South Forest stretched for miles inside and all around the edges of the Mau within the Narok boundaries. 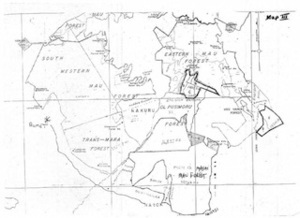 Small parcels of land multiplied into their tens as land surveyors were instructed to redraw the map of the original piece of land and eat up the forest. There were several other schemes. At times land was sold by the agent/ broker to a relatively poor immigrant, and subsequently offered by the politically connected seller to a prominent national government official. This was in exchange for political patronage. The gamble was that although the immigrant would soon occupy the land, the prominent national politician would hardly bother to actually visit the piece of land, let alone take real ownership. One piece of land could thus be used for both financial gain and political reward. Also, in the overtures and initial negotiations in Kisii and Bomet, promises were made and cash deposits given by the land-hungry as a commitment of interest. Once the preliminary agreement was signed, a date was set for the new landowners to come to Narok to finalise the deal. Sometimes these deals never panned out, and many lost their deposits to crooked brokers. The clearing of the forest also generated timber and charcoal for the sellers. The new areas brought in retail commerce that was controlled by cartels connected to the sale of the forest. A thriving new economy was created in all sorts of ways. What eventually stopped the game was the change of political regimes in December 2002, when Mwai Kibaki took over from Daniel arap Moi. And so the language of eating forest completely changed. Suddenly all the land-buying immigrants were labelled encroachers (the majority were from Moi’s tribe, the Kalenjin, who found themselves at a disadvantage within the new political dispensation), even if they had possibly given up their life savings for virgin land with real title deeds. “Encroaching” became the new buzz word. The fashionable word in independent Africa has always been “squatter” in this kind of circumstance. But an encroacher was seen as a “foreign invader”, whereas a squatter was a property-less local individual. A squatter was considered to be relatively harmless, while the encroacher was seen to be intrud- ing upon and seizing property that had been clearly mapped and was already owned. In the Mau context, a primordial hatred developed towards encroachers. Hand-in-hand with this debate about who was an encroacher and who was “genuine” was another aspect of the Mau South issue—the question of indigeneity. Among the title deed brigade from Narok District involved in the illegal sale of the forest were individuals from the Narok Ogiek community. The Ogiek seemed to have emerged into the national psyche around 1994, after the United Nations declared an International Day for Indigenous People. Non-governmental organisations were set up in Narok by individuals, until then popularly known as Ndorobos, to start fighting for their rights. The leaders of this movement took up their new name, the Ogiek (meaning “caretaker of all animals and plants”) and claimed a unique and conservation-friendly relationship with the forest. Most of these conflicts are expressed in the form of an opposition between autochthonous populations and strangers. Citizenship is conceived in ethnic and territorial terms, and an individual’s enjoyment of civil rights depends on his appurtenance to an ethnic group or locality. Travelling along the recently built Narok-Kisii Highway back in 2005, at the height of the Mau South saga, the road is an arrow-straight, mirror-like asphalt running parallel to the rapidly shrinking southernmost borders of the Mau South Forest. Feeder roads turn to the right and branch in the general direction of the forest every 15 km. The land is flat and monotonous, and even in a speeding car one feels as if standing still. A truck in the distance looks like a Matchbox toy. The horizon is so straight that the edge of the sky looks like a brilliant fairy tale lake from Hans Christian Andersen. We feel as if we are at the end of Kenya, and in a sense we are. The southernmost border of Narok District is also the Tanzania-Kenya border. The Mau South Forest starts 17 km from Narok town. It has an area of 46,278 ha and sits astride Narok District, extending west and north. It is the southernmost part of the once 290,000 ha Mau complex that borders Kericho to the west and Nakuru to the north. It is often said that it was once larger than Nairobi Province. We are looking for an Ogiek man, Samuel Kamikil, who, we are told, knows how the forest was eaten. We go down the first road off the Narok Highway that turns off in the general direction of the Maasai Mau Forest into Ngareta location. The Ogiek, according to some, have lived here for at least three generations. Ngareta location straddles both north and south Narok and is about 20 km from Narok town. Further down the highway there are three more right turns that lead into other small Maasai, Kipsigis, and Ogiek communities and trading centres—Chebulenga, Ololonga and Mulot—and eventually into the forest. The first and third names respectively are Luyha and Kalenjin—signs of the modern colonisation that took place in these spaces in the late 1990s and into the millennium. Some of the roads leading to the forest’s southern border were built for the sole purpose of illegally accessing the forest. The straight, dusty road we travel on to meet this man, Kamikil, is of the kind that grinds the bones and the drive shafts of a car. We meet combine harvesters, tractors, black mamba bicycles, and an old drunken woman who flags us down and proceeds to curse heavily when we stop. She then makes out as if to spit, but all that comes out is the harsh question “Mnataka msitu?” You want forest? We find Samuel Kamikil sitting by the roadside with his children. The Ogiek say that they recognise each other from looking at the eyes. Our first impression of Kamikil is his weird and close resemblance to the U.S. actor Scott Glenn. Kamikil is tough, sharp-eyed, wiry, thin, and outdoorsy but at the same time extremely soft-spoken and self-deprecating. He has riveting, piercing eyes like the actor. Samuel Kamikil does not remember the exact year he was born. “Nilizaliwa wakati wa Mau Mau. Siku Hio. I was born at the time of the Mau Mau.” Those days. He suddenly hands over his ID, and it gives his date of birth as 1964, at least six years after the Mau Mau surrendered. Also, the name on his ID is Salaton Ole Nadunguenkop, which is a Maasai name unlike most Narok Ogiek names. Ogiek names are actually Kalenjin. And Kamikil sounds like a Kalenjin name—we have yet to figure out why he has two names. The Ogiek claim that the taking of Maasai or Kalenjin names happened back in 1930 when a colonial proposition to the Land Commission to assimilate the Ogiek into the neighbouring tribes with whom they had closest affinity was enforced. “Before we started building huts we were living in ngabuna (structures of leaf, branches, and bark). We also lived inside stony hillsides where we spent nights and rainy days. Suddenly the old Maasai woman we met on the roadside on the way to the interview appears. She has a friend in tow and they start shouting drunkenly from the road at us sitting in the grass. All I can make out is “Ndorobo, Ndorobo.” This goes on for several minutes and then they move on, muttering loudly. One of the other Ogiek men sitting with us tells us the woman was accusing Ndorobos of selling the forest. He laughs nervously. We learn later that this is the general sentiment in Narok District among the Masaai when it comes to the Ogiek. Many Maasai, including a Narok County councillor we talk to, hold the “Ndorobo” in the lowest possible regard. Statements about the Ogiek are either dismissive or extremely bigoted. The councillor tells us that the Maasai have never disturbed the forest, which was used as a grazing area during drought in the lower plains south of the Mau South Forest. Before we drive off he insists we take a photo of him in traditional skins. It is important for the world to know how the Ogiek live. He is dressed like any modestly prosperous Kenyan farmer: nondescript canvas jacket, collared flowered shirt, standard khaki trousers and safari boots, complete with a cane. His son, a boy in his early teens, has been fiddling with my cellphone and asks me to bring him one like it the following day. The next day we meet Kamikil and bring a guide called Michael Setek with us. Setek is the treasurer of a local NGO known as Friends of the Mau Forest. He is also Maasai and has lived in the area all his life, and has been fighting for the protection of the Mau South Forest since he was in his teens. When we try to introduce Setek to Ole Nadunguenkop, the former laughs loudly. The two exchange a greeting that we’ve never heard. “B-o-p” is roughly what it sounds like. Ole Nadunguenkop gives a wry grin. We drive to the edge of the Mau South Forest and start to walk into it in single file. We are at the extreme boundary of Narok South constituency and once we cross the river into the forest we enter into Narok North. We leave MP Ole Ntutu’s land and enter MP Ntimama’s country, which is still dense, undisturbed forest. Setek and I walk slightly ahead. A colleague walks behind us with the man we are now thinking of as Salaton Ole Nadunguenkop, as constantly reaffirmed by Setek. Often Ole Nadunguenkop shouts directions from behind when we come to forked paths. Once we are in the forest, Ole Nadunguenkop exudes a calm authority, unlike yesterday’s measured deference. We move from sparse tree cover to a large flat glade and start climbing into deep, thick forest. The air becomes fresher as we reach higher altitudes. Though it is a relatively hot day, it is wet and cool in the forest. Setek laughs when I enquire how he knows Kamikil. As we climb higher there are more trees now, and it is ever more silent. Now and then we find a felled tree and several posts lying around it. We go through dense underbrush for about 20 minutes and suddenly come into a clearing straight out of the TV version of Swiss Family Robinson. There is a clearly demarcated homestead with three wooden huts, two mud ones and a small goat shed. Sloping around the buildings is some of the finest crop of maize we have ever seen. But weeds are now growing through it. There are also fat cabbages and sprouting beans. All around the clearing are tall, dense trees. This is Ole Nadunguenkop’s home. I can’t imagine how the new NARC government ever found him. Later we will learn there are homesteads still deeper in the forest. As we stand there silently, the post-bearing man suddenly reappears from the trees. He tells us his name, and that he originally hails from beyond Bomet town and is Kipsigis. He came to Narok a year ago and Ole Nadunguenkop “sold” him a piece of land. There were no title deeds in this particular transaction, and it took place in a different time before NARC would ever have found Ole Nadunguenkop. “Ukikuja unaongea tuu na Mzee (Ole Nadunguenkop),” the man says. One would just talk to Ole Nadunguenkop. The man eventually married into his new benefactor’s family and occupies the homestead next to Ole Nadunguenkop. He farms his own land and also doubles as a worker for the “old man,” Ole Nadunguenkop, now and then when needed. Cutting down the odd tree. There is a pile of fresh-looking posts next to the burnt shell of Ole Nadunguenkop’s former home. In Kiambu the small pile would be worth several thousand shillings. Today things have become very different very quickly, triggered by a series of coincidences—the most important of which is inadvertently having brought Setek along with us. Yesterday Samuel Kamkil was extremely voluble about his life as an Ogiek. Today, as Ole Nadunguenkop, he seems uneasy. He admits to us that he has no title deed for this particular piece of land. But he says this as if it is of no consequence, and without any irony. Like a man talking about the weather. At the heart of it, he is Samuel Kamikil, an Ogiek, and believes that the forest belongs to him and he can sell it as he wills. When we ask who else has sold land in the forest, Ole Nadunguenkop says he and his brother have a land association. He is the chairman. “Inaitwa Ogiek Association Group,” he says. This is the first time since we’ve met him that he has used the term “Ogiek.” I do not ask whether the association is registered. Ole Nadunguenkop is the first living signpost we meet of an Ogiek schizophrenia that wavers between the Ogiek as conservationist and the Ogiek as land broker. When it comes to the Mau Forest, he will not be the last. Like Samuel Kamikil/Salaton Ole Nadunguenkop, many Ogiek we eventually encounter seem to be two things, an interface between the ideal and the real: Samuel Kamikil, who claims to be dispossessed and landless, is a forest dweller and hunter-gatherer who lives on honey; and Salaton Ole Nadunguenkop, who is a Mau Forest broker, is a landowner, and drives a Subaru. After Kamikil/Ole Nadunguenkop we encounter the interface between Ndorobos, who in reinventing themselves as Ogieks became one of the last indigenous Kenyan peoples, long-suffering and landless, and, on the other hand, the members of large, rich Ogiek landowning families who are lawyers, professors, human rights activists, and NGO heads, and who are dabbling in eating forest. A protector, I suppose, is free to do anything with what he protects, and he is also free to claim an innocence at the same time. Later in our travels in the region, we will acquire a 54 million Kenyan shilling sales agreement with Ole Nadunguenkop’s name on it. A source reveals to us that Kamikil is probably just an agent for more powerful forces in Narok South involved in the large-scale illegal sale of the Mau South Forest. The names of powerful Narok politicians come up. In a sense our theory and observations about Ogiek schizophrenia are not necessarily true. And then I remember him telling us that he cannot read and write, and that he signs everything with his thumbprint. Naweka alama. But I also remember him saying that his father took him to school. Billy Kahora is the managing editor of Kwani Trust, where he has edited seven issues of Kwani? journal. His writing has appeared in Chimurenga, McSweeney’s, Granta Online, Internazionale, Vanity Fair, and Kwani?. He is the author of the nonfiction book The Story of David Munyakei and has been shortlisted for the Caine Prize twice. He wrote the screenplay for Soul Boy and co-wrote Nairobi Half Life. Kahora is also a contributing editor at the Chimurenga Chronic.